It’s been a rough week for the Los Angeles Lakers, and the team’s struggles seem to be taking a toll on head coach Mike D’Antoni, who told impatient fans that they should "find another team to root for" if they’re unhappy with the way the Lakers have been playing. It all really started with the disheartening news late last week that Kobe Bryant, who had been back on the floor for all of six games after injuring his Achilles last season, would be sidelined another six weeks or more with a fracture in his knee. The Lakers responded to the news by beating the Minnesota Timberwolves the next night, but then the two games since have seen LA suffer blowout losses to Golden State and Phoenix — the latter of which used 17 points and 20 rebounds from Miles Plumlee to drop the Lakers to 13-15 on the season. After the loss to Phoenix, one daring reporter apparently asked D’Antoni if fans should be "discouraged" with the way the team has played of late, and the coach let him have it, channeling Jim Mora in the process. "If they’re discouraged, then find another team to root for," D’Antoni told reporters, according to the LA Times. "We’re not going to give up. Are you kidding me? Discouraged? That’s not even fair to these guys." D’Antoni then continued his rant — before ending his presser with, "I’m out, guys; I’m done" — and stuck by his message that you’re either with the Lakers, or you’re against them. 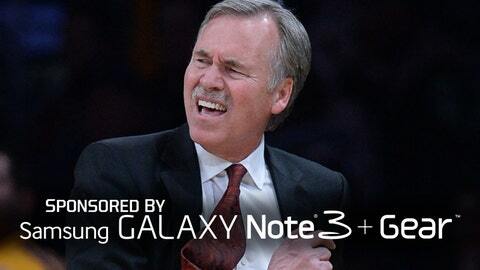 "Guys, I mean, it’s like, OK, we lost two road games," D’Antoni said, via the Times. "It takes some adjusting. We’ve got to get somebody healthy. We’ll be back. We’re not going anywhere. "We’re going to fight and we’re going to try and stay above .500. We’ve got a nice homestand coming up, and if anybody hangs their head, they don’t need to be on our bandwagon." By Tuesday, however, the Lakers’ coach had already reportedly changed his tune. "I was an idiot last night. I was out of my mind. I was ticked off," D’Antoni said after Tuesday’s practice. "We didn’t play well. That was a game that we could’ve won, and we didn’t do it. So I said some stuff I shouldn’t have said. That’s it. I just made a mistake." If only there were another team in LA worth rooting for . . .
• A Colorado State assistant was suspended two weeks without pay for using an anti-gay slur during the team’s New Mexico Bowl win. • Roger Federer and his wife are expecting. • A college hockey player and his coach were suspended after the school didn’t follow proper protocol when reimbursing the player for a stolen watch. • Marcus Lattimore wrote a thank-you letter to South Carolina fans. • Who has the most commonly forged signature in sports? • Gregg Popovich says he can’t remember the last time the Spurs practiced. • Akron assistant football coach Alan Arrington was killed in a car accident in Mississippi. • Terrelle Pryor tweeted out an apology after his agent criticized the Raiders. • A former UNLV player announced plans to break ground on a 22,000-seat arena on the Vegas strip.